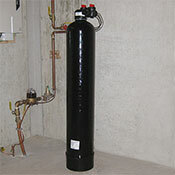 Whole house water filters provide the ultimate functionality and filtration for all your purifying needs. Enjoy cooking, drinking and washing in only the purest, cleanest water. These types of water filters are virtually maintenance free and provide multi stage filtration provide protection from chemicals, bacteria, volatile organic compounds and industrial solvents among other things. A whole house system is a convenient and cost effective solution for anyone looking for high capacity filtration resulting in excellent tap water for all your drinking, bathing and cooking needs.